Hey everyone! I hope you all had a great Christmas and New Year. I took an unplanned break from blogging, but I am ready to go now because the new Occasions Catalog launches today! There are some awesome new products in there! If need a copy, just let me know! The monthly challenge over on Catherine & Cathy Create is to doodle on your projects. At first I had no idea what to do for this challenge, but then I was inspired by the (new) Geometrical stamp set. This (pretty awesome) card was for my sister's birthday. I both stamped and doodled on this card. 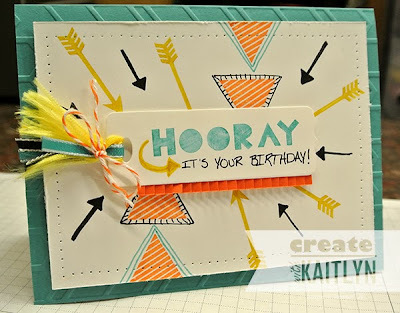 The sentiment originally said "Hooray for today," but I used my Bermuda Bay Stampin' Write Marker to just stamp the "Hooray" and I then wrote "it's your birthday" underneath. 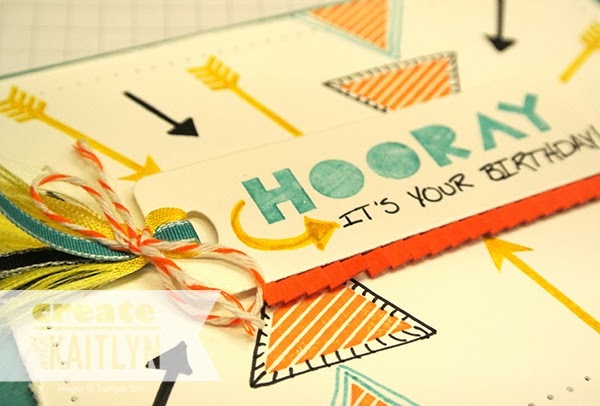 (The Stampin' Write Markers a must for doodling on your projects!) The triangles and Crushed Curry arrows are stamped and I doodled in the Basic Black arrows and around the triangles. I don't often doodle on my cards, but it was fun! You should give it a try! I have just a couple of tips to share with you on this card. The fringe was made using the (new) Fringe Scissors. (Yes, Fringe Scissors! They are as awesome as it sounds!) I unraveled some Daffodil Delight Seam Binding to make it all crazy and fringe-like. Be sure to head on over the Catherine & Cathy Create to see what the other designers have created and join in on the Doodle Challenge. OMG We have the same name and that is so rare! Same spelling of name and I love creating things!!! !